Following the series of severe thunderstorms and heavy rains Drew County has had recently, and old problem has returned to Monticello. 10–12 years ago, the city replaced the underground culvert that drains under Oakland Cemetery. Years later, that pipe has eroded/collapsed in mul areas, causing several sinkholes in the town’s cemetery. MLive spoke with Mayor David Anderson and city superintendent L. M. Wood, Monday morning. Both stated that this has been an ongoing problem, for years. Residents should be aware that the effected area is only near the underground drain, and not in area where gravesites are located. The area is also marked off with caution tape, to prevent people from accidentally wandering into the collapsing section. 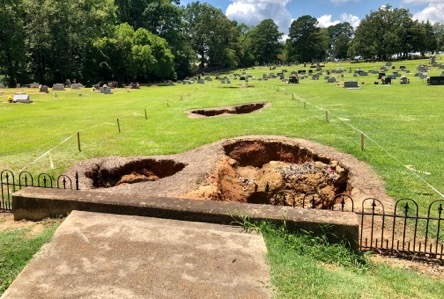 When the underground drain was installed, the city knew that this was possible, so no graves were located in this general area, due to this reason. The city expects to begin working to repair the project situation this week. This entry was posted on Monday, July 9th, 2018 at 11:26 am	and is filed under City. You can follow any responses to this entry through the RSS 2.0 feed. You can leave a response, or trackback from your own site.